Fun, exciting, interactive, and inclusive „ these sets of content-based games help students master curriculum outlined in the current NSES Standards for grades 1-8. Written by teachers using research-based principles, each game has been tested and proven effective in classrooms like yours. 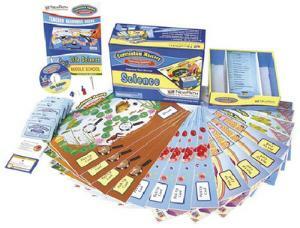 Each Class Pack set of games provides comprehensive coverage of topics required for science testing at that grade level. Engage students in learning with over 750 review cards, each set focused on a specific topic, and an additional 12 double-sided game boards for study and review. The Class Packs include materials for 36 students, an extensive teacher's guide, a presentation CD featuring interactive review questions for use on your computer or projection unit, and a free introductory online subscription to interactive content, activities, and assessments. Designed to stimulate parental involvement, the Take-Home edition mirrors the Class pack content through 25 individually packaged games, a parent resource guide, presentation CD, and online subscription. These kits are designed to help parents reinforce science concepts at home in fun, new ways. Each game features a set of 30 standards-based review questions, a double-sided game board, and materials for up to four children. Games address content of middle school life science curriculum. Includes the standards-based topics: The World of Life Science; Diversity of Life; Cells: The Basic Units of Life; Cell Processes; Cell Reproduction; Genetics — Study of Heredity; Modern Genetics; The Evolution and Interaction of Living Things; Bacteria and Viruses; Protists and Fungi; Introduction to Plants; Plant Processes; Plant Reproduction; Introduction to Animals; Sponges, Cnidarians and Worms; Mollusks, Arthropods, and Echinoderms; Fishes, Amphibians, and Reptiles; Birds and Mammals; Bones, Muscles, and Skin; The Digestive System and Nutrition; Circulation and Immunity; Respiration and Excretion; The Nervous System; The Endocrine System and Reproduction; and Ecosystems, Food Chains, and Food Webs.